This is part 4 of a six-part series of guest posts by Tomer Perry, Research Associate at the Edmond J. Safra Center for Ethics, Harvard University. He can be contacted at tperry [at] ethics [dot] harvard [dot] edu. I have defined games as systems in which players engage in artificial conflict, defined by rules, that result in measurable outcomes. Previously I discussed the artificiality, thinking about drawing students into the magic circle, and the different types of conflict we can build our activities around. Next we have rules and outcomes will be covered in a future post. Rules must be clear. Rules-writing is one of the most difficult tasks in game design and so designers spend a lot of time testing, revising and clarifying their rules. So the first recommendation is – test your assignment instructions repeatedly and adjust them as needed to make sure students understand them. If you’re rules are not clear enough, how can you improve them? The first thing to consider is whether you have too many rules or too few. Too many rules are hard to read and understand. Many of my friends are extremely annoyed that students ask them questions the answers to which are in the syllabus. If you get those kinds of questions from students, chances are your syllabus is too long. Yet if you condense your syllabus to a readable bite size, you might end up with too few rules: and too few rules lead to misunderstandings, ambiguity and frustration as students spend their time doing the wrong thing. The key is then to balance these concerns and have the right amount of rules – enough to let students know what they need to know but not too much to overwhelm them. How do you do that? One helpful concept is ‘just-in-time’ information – give your students only the information they need at the moment, and give them additional information when they need it. This is done exceptionally well in the board game Terra Mystica, where players build little cities to place on the board. Each city you build increases a player’s income by one cube but instead of just writing it in the rules, when a player removes a city from their player board they reveal an image of a cube hovering over a hand, signifying income. A player who built four cities will, at a glance, four cubes and know immediately their income even if they didn’t memorize the rule. Just-in-time information is an idea that can probably do wonders for the syllabus you pass along in the beginning of the semester – it doesn’t have to include the reading for the entire semester. In the first class, let students know what they need about the course overall and introduce them to readings as you go along each week. 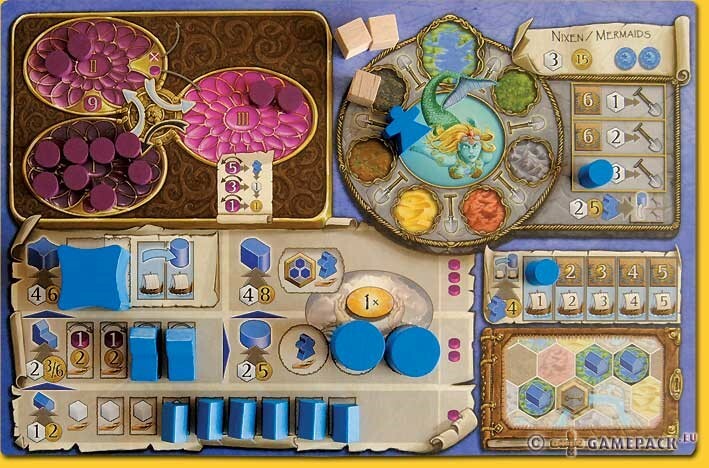 Another helpful idea is that of multi-modal and redundant indicators: Terra Mystica does a great job conveying its rules because the rules aren’t just in the rulebook. The board and components remind players of the rules precisely when needed and in a variety of different forms: in writing, with an image, in the story being told, and in the actions of players. Your simulations will flow much more smoothly if you help your students understand the rules by presenting them in a variety of redundant ways, in the moment they are needed. Whatever you do with the rules you’re not going to be able to define all the rules that your students will need to follow. There are always unwritten rules – some norms that students accept or take for granted without reading them anywhere. You can’t really control for unwritten rules but you should be aware of them. If students are going about the game all wrong in ways that undermine its purpose, then they are probably operating on too many unwritten rules, and too few written ones. Adjust accordingly, and try again.